Porpoises are marine mammals in the order Cetacea. The vaquita (Phocoena sinus) is both the smallest porpoise and the smallest cetacean in the world. It lives in the northern part of the Gulf of California and is critically endangered. 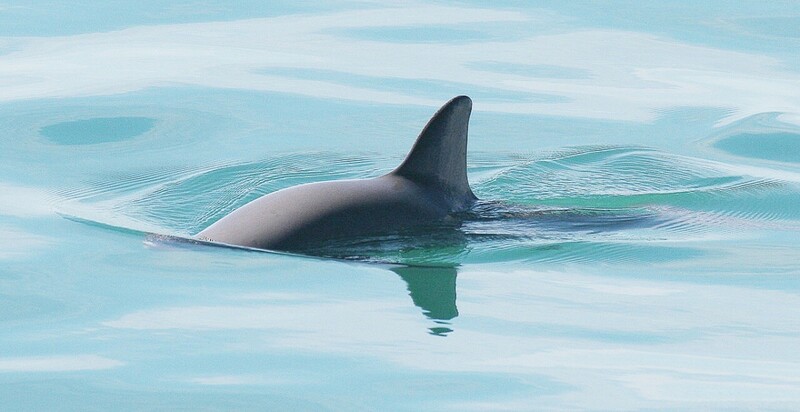 The harbour porpoise (Phocoena phocoena) belongs to the same genus as the vaquita and can therefore be considered a relative. It's seen in estuaries and rivers as well as the ocean. In general, the species is doing well. 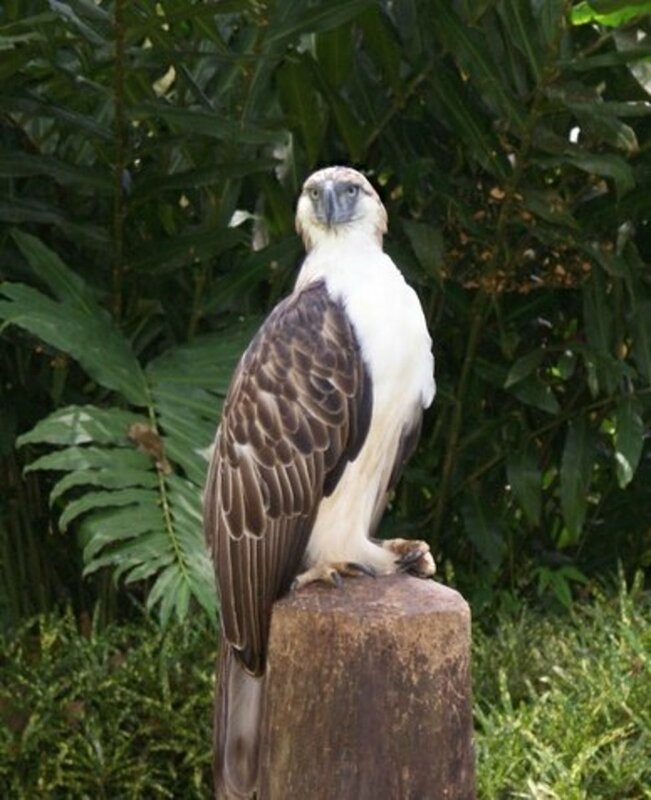 One subspecies is endangered and one subpopulation is critically endangered, however. 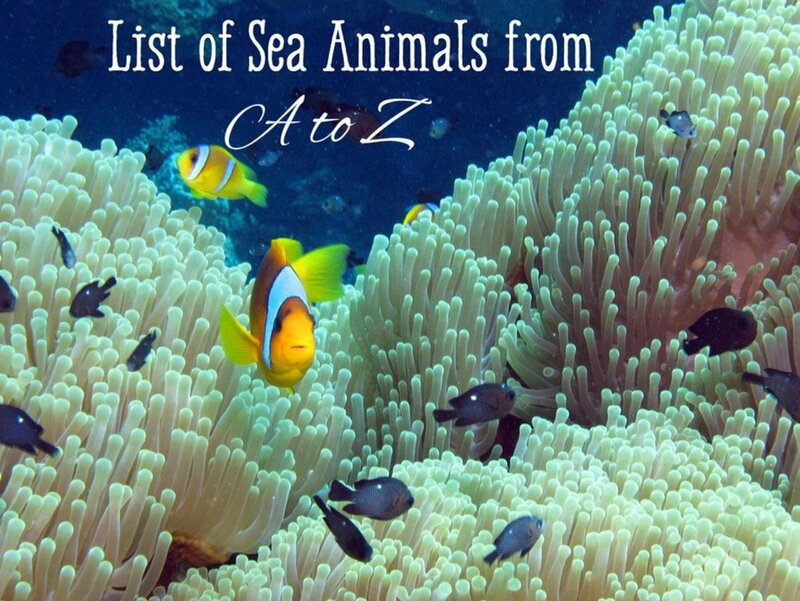 The order Cetacea includes whales and dolphins as well as porpoises. Like their relatives, porpoises are intelligent animals that are well adapted for life in the ocean. They resemble dolphins in appearance, but their bodies are generally shorter and stockier. In addition, the fin on their back has a triangular appearance in contrast to the curved or hooked fins of dolphins. We know more about dolphins than porpoises. Only six species of porpoises exist while the number of dolphin species is somewhere between thirty and forty. In addition, porpoises tend to be reclusive animals. A vaquita is a small, dark grey porpoise that reaches a maximum length of just under five feet and weighs up to 120 pounds. Most members of the species are smaller. The porpoise has a conspicuous black ring around each eye. It also has a black line around its lips, which gives the appearance of a smile. A dark line extends from the cheek to the pectoral fin or flipper on the side of the porpoise. 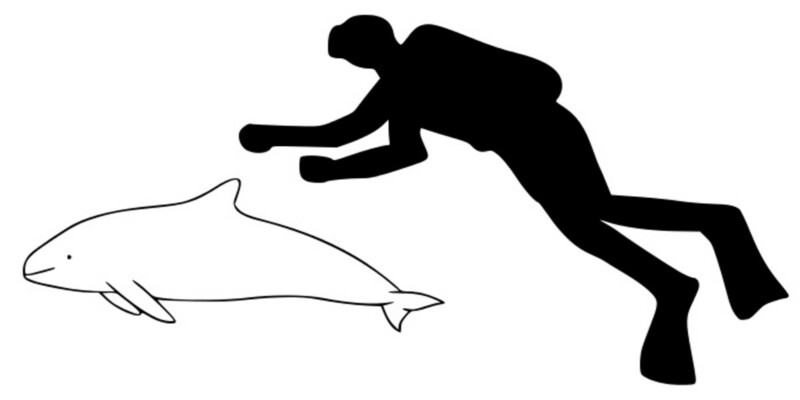 The vaquita's body can be seen in the first video below. Unfortunately, the animals in the video are dead. There aren't many photos of living vaquitas. The vaquita is sometimes known as the desert porpoise or the vaquita marina. It lives in a small area in the northern section of the Gulf of California, also called the Sea of Cortez. The Gulf is a narrow strip of ocean between Baja California and the Mexican mainland. The water in the Gulf is warm and the surrounding land is a desert. Vaquitas live in turbid water and avoid human contact, so it's often hard for scientists to study them. They prefer shallow water close to the shoreline. 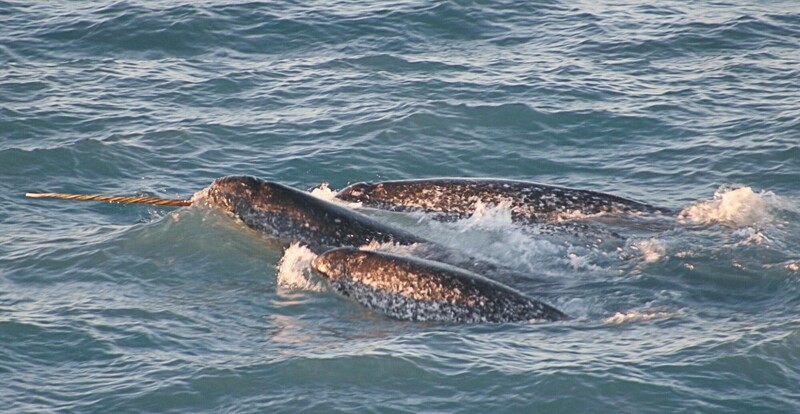 Researchers have observed that the animals travel on their own or in pairs, which often consist of a mother and her calf. Occasionally they are seen in larger groups consisting of eight to ten animals. The fin on the top of a cetacean's body is known as the dorsal fin. The fin on each side is known as a pectoral fin or a flipper. The two fins that form the tail are known as flukes. Although the word "fin" is used in reference to cetaceans, they are mammals like us and not fish. Analysis of stomach contents from dead vaquitas indicates that they feed on fish, squid, and crustaceans. Like other cetaceans, vaquitas use echolocation to detect their surroundings. In this process the animal emits sound waves. The sound waves strike objects and are reflected back to the porpoise. The reflected waves provide information about the environment. A female vaquita is thought to produce one calf every other year. Gestation is probably ten to eleven months. The female may not reproduce until she is about six years old. The vaquita is believed to have a maximum lifespan of 21 years, but in general it probably lives for a shorter time. The vaquita was discovered by scientists in 1958, based on the appearance of some skulls. An intact animal wasn't found until 1985. In 2017—just thirty-two years after the animal was first seen by scientists—there were believed to be fewer than thirty vaquitas still in existence. Researchers say that vaquitas are killed each year by becoming trapped in fishing nets, especially gillnets. Despite having an echolocation system, the animals are unable to detect the nets. Although porpoises have special adaptations to help them stay underwater for a long time, they must surface to breathe and will drown if they are forcibly held underwater. Vaquitas are believed to have a low reproductive rate, which means that when a large number of animals die the population can't be replenished quickly. The vaquita will most likely become extinct very soon unless dramatic changes are made to help the animal. More than half of the (vaquita) population has been lost in the last three years. The vaquita is considered to be the most endangered cetacean. The animal that until recently was the most endangered cetacean in the world—the Yangtze river dolphin or baiji—is believed to be either extinct or functionally extinct. The latter term means that there are not enough animals left for successful reproduction. In 2006 an international research team spend six weeks performing a detailed survey of the historical range of the baiji, using a variety of equipment. They found no evidence that the animal still exists. The extinction is believed to be due to being caught as bycatch, degradation of the environment, and collisions with ships. When I updated this article in 2016, the vaquita population was estimated to be less than a hundred animals. In 2017, the estimate was less than thirty. In 2018, unofficial estimates suggested that only twelve animals exist. In October of that year, scientists saw a group of six vaquitas, which included a calf. The researchers say that this didn’t represent the entire population of the species. Conservation organizations are very concerned about the fate of the vaquita. A refuge has been established in the area where the animal lives. A major problem is that the people in the area rely on fishing for their income, however. In order to save the vaquita the local people need to be helped, too. The Mexican government is offering a compensation program to fishermen in the refuge. There are three options in this program. Alternative Livelihood or Buyout: The fishermen surrender their boats, fishing gear, and fishing permits and receive compensation in return. Alternative Fishing Gear Development or Switch Out: The fishermen switch to alternate gear that doesn't trap vaquitas. Conservation Activities or Rent Out: The fishermen agree to eliminate all fishing in the refuge and receive compensation for this agreement. In order for this program to be successful, the fishermen must earn as much money from the alternate livelihood or fishing method as they did from their previous livelihood. If they don't, the program is doomed to failure. In addition, the refuge has to be monitored effectively to ensure that all rules and regulations are being followed and that vaquitas are safe. Fortunately, the compensation program has been offered for some time and has been helpful. In fact, in 2011 there was optimism that the vaquita could be saved. Unfortunately, today the vaquitas face another threat besides local fishermen. The totoaba is a large fish that lives in the vaquita's habitat. Its maximum length is a little over six feet. International trade in this critically endangered fish is prohibited and they are becoming harder to find. Nevertheless, an illegal gillnet fishery occurs in the Gulf of California, which traps vaquitas as bycatch. "Bycatch" is an animal that is caught unintentionally while people are fishing for another creature. Totoabas are highly valued in China for their swim bladders and earn fisherman a lot of money. A single swim bladder can sell for thousands of dollars, which makes it a very tempting catch. The swim bladder is considered to be both a delicacy and a health food. The illegal fishery for totoabas is the primary cause of the current decline in the vaquita population. Both the fish and the porpoise are in serious trouble. The good news is that the Mexican navy is currently taken a more active role in fighting illegal fishing and the Sea Shepherd Conservation Society is removing nets that they find. The bad news is that the poachers are trying to find ways to outwit the protectors. Barbara Taylor is a conservation biologist with NOAA (National Oceanic and Atmospheric Administration). She was involved in the hunt for the baiji in 2006. She notes that the baiji had an additional problem to fight compared to the vaquita. The baiji's former habitat is very polluted. The vaquita's is comparatively pristine. This may give the porpoise an advantage in its fight to survive. Taylor offers the following warning, however. If we can’t save vaquitas here, where there’s only one threat, what can we save? Gillnets became illegal in the Gulf of California in 2017, but they are still being used. In February 2018, World Wildlife Fund Canada announced the creation of a new type of fishing net that may not trap vaquitas. The Marine Institute in Newfoundland demonstrated the net in a test tank in which the creators simulated trawling for fish. The creators say that the net traps many types of fish and squid but allows vaquitas and sharks to escape. The goal of the creators is to encourage everyone—including people who are still using gillnets in the gulf—to use the new net. It's unknown whether this plan will work or whether it's too late to save the vaquita, but it's certainly worth trying. In 2017 alone, a WWF-Mexico program collected more than 500 “ghost” gillnets that were in the gulf, abandoned but floating in the ocean, still able to harm wildlife. It is extremely sad to think that a unique animal like the vaquita could become extinct in the near future. Even sadder, the animal may become extinct before we've discovered much about it. Humans caused the demise of the baiji. We may also cause the demise of the vaquita. Mexican authorities have attempted to capture vaquitas in order to preserve the species in captivity. The attempt ended when one of the animals died after it was captured. The vaquita has a public relations problem. It stays away from humans and lives a very private life. It doesn't swim close to boats or inspect people as some dolphins do, and it doesn't perform aerial displays. It's seen most clearly when its dead body is hauled up in fishing nets. It may be hard for some people to appreciate vaquitas without seeing living animals. In addition, the vaquita's range is so restricted and its discovery so recent that many people have never heard of the animal. Vaquitas are beautiful creatures. There is so much to learn about them. 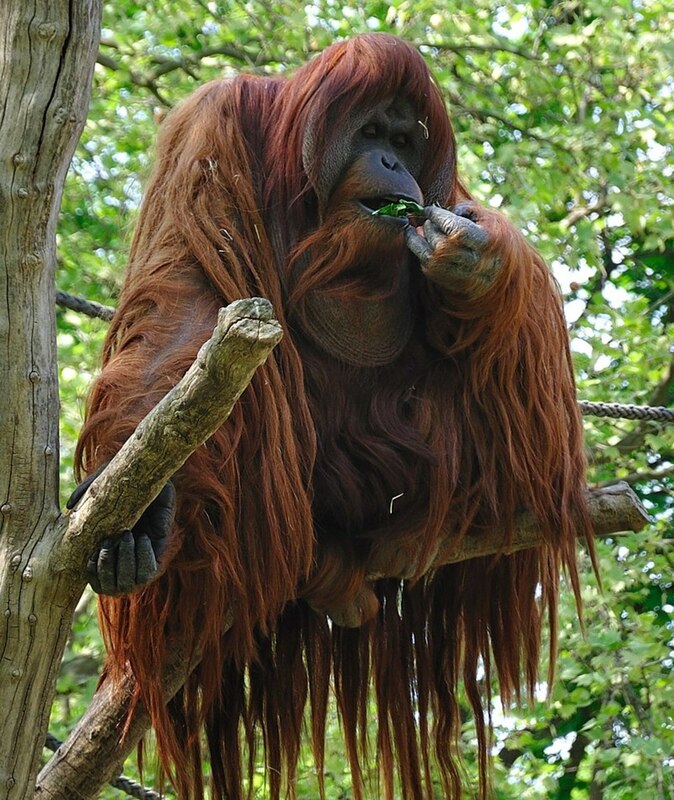 Like their relatives, they are probably intelligent animals with fascinating lives and abilities. 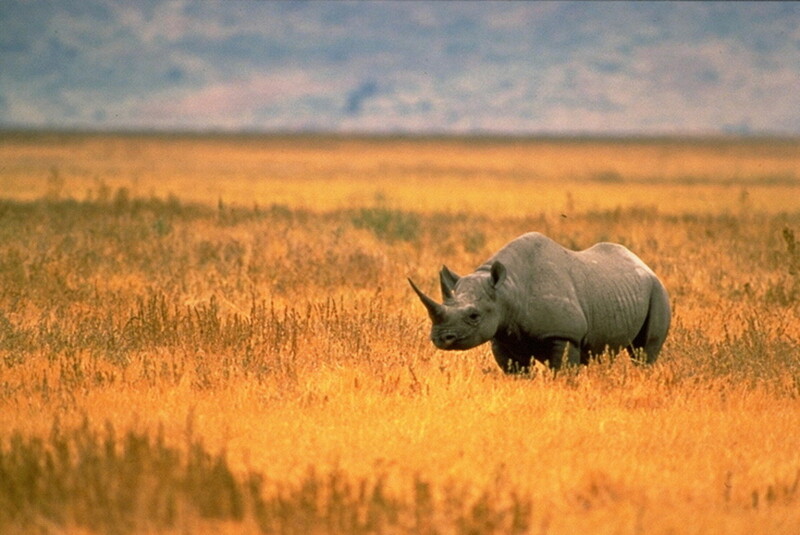 It may be possible to save the species, but the likelihood is decreasing rapidly. Action must be taken now. Vaquitas and their plight need to be publicized and organizations that have the best chance of helping them need to be supported and encouraged. The story of the harbour porpoise is a happier one than that of the vaquita, although there is some concern about the animal's future. The porpoise lives in shallow water close to the shore. It's often found in harbours and bays, but it will sometimes venture into estuaries and up rivers. It lives in both the North Pacific and the North Atlantic Ocean. The porpoise has a stocky appearance. It has a dark grey or blue-grey back and a paler undersurface. It reaches a maximum length of six feet but is usually shorter than five feet. The animal weighs 130 pounds or less. Although a harbour porpoise can dive to more than 650 feet, it prefers to travel close to the water surface. It surfaces frequently to breathe, producing a distinctive puffing sound that resembles a sneeze. It's sometimes referred to as a "puffing pig". There are still unanswered questions about the life of the porpoise in the wild. The animal is most often noticed in a brief appearance at the water surface. 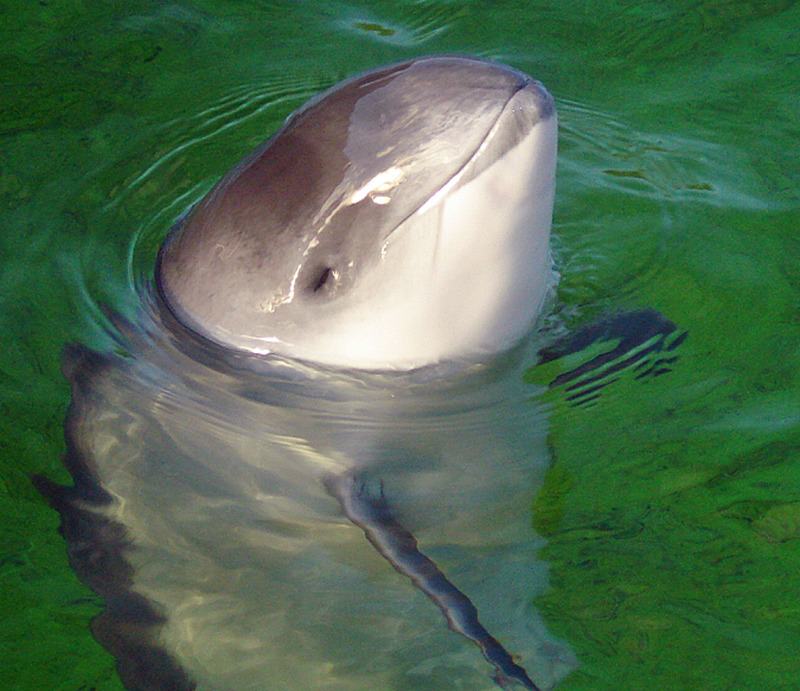 Harbour porpoises travel alone or in small groups of two to five individuals. They feed mainly on fish but eat some invertebrates too. Like many other cetaceans, they use echolocation to detect objects and food. Predators of harbour porpoises include killer whales and large sharks. The porpoises have also been killed by bottlenose dolphins in both North America and Europe. These attacks don't seem to be motivated by a desire for food. The attackers are mainly young male dolphins. They ram the unfortunate porpoises and drown them. The reason for the attacks isn't known for certain, but the leading theory is that they have something to do with the dolphins' frustrations during the breeding season. Harbour porpoises mate in the summer. The gestation period is about eleven months and only one calf is born. The calf suckles for around eight months and is ready to reproduce at around four years of age. The animals generally live for around twelve years. Nearly all die before they reach twenty years of age. The harbour porpoise is better known than the vaquita and has a much wider distribution. It lives in areas close to humans. In addition, the porpoises are kept in some public aquariums, where visitors can see them up close. They are shy animals that generally stay away from boats and rarely leap out of the water, but in captivity they get used to their caregivers. The International Union for Conservation of Nature, or IUCN, classifies the harbour porpoise species as a whole in its "Least Concern" category. Nevertheless, in some parts of its distribution the animal is experiencing problems. The Black Sea subspecies (Phocoena phocoena ssp. relicta) is endangered. It has both genetic and physical differences from the rest of the species. Its population size is unknown, but the IUCN estimates that the size is in the range of several thousand to the low tens of thousands. The Baltic Sea subpopulation of the harbour porpoise is critically endangered. The population is thought to be around 500 animals. 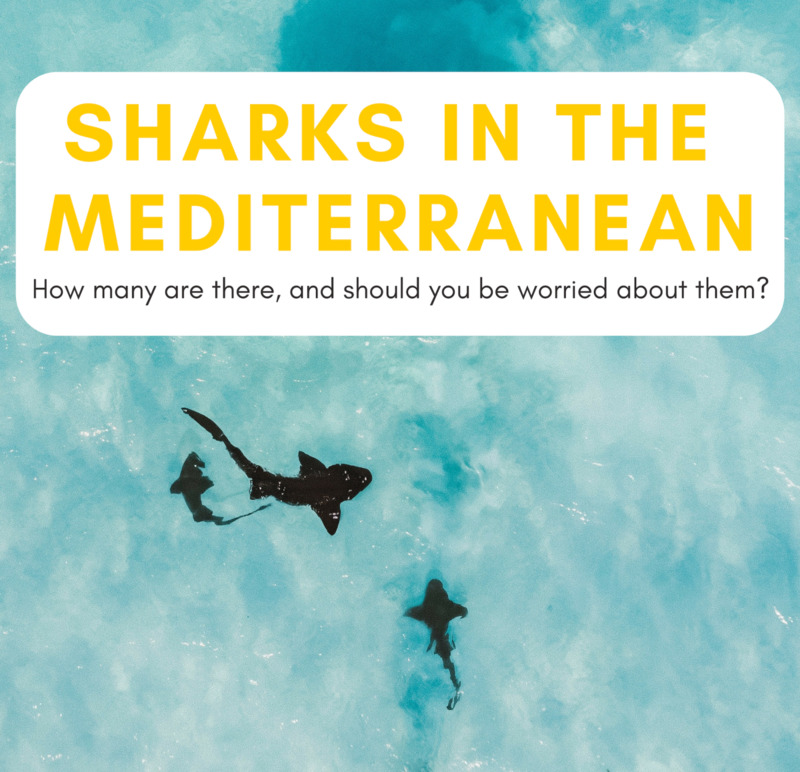 Some people might assume that when a species as a whole is abundant, it doesn't matter if a particular subpecies (or subpopulation) containing a relatively small number of animals vanishes. The disappearance may be important biologically, however. Although the subspecies of a species are similar enough to breed with one another, they have genetic differences. If a subspecies becomes extinct, we lose potentially valuable genes from the species and from the Earth and we reduce biodiversity. In addition, the loss of one group of animals may sometimes be a warning sign about the fate of the species as a whole. The data also show that the Baltic harbour porpoise is clearly separated during the calving and mating period from their more abundant westerly neighbours. Like the vaquita, the harbour porpoise gets caught in gillnets and other types of fishing nets as bycatch. It's unknown whether the porpoises fail to detect the nets with echolocation or whether they get trapped in the nets while they're not echolocating. Bycatch is the main problem faced by the Black Sea and Baltic Sea animals. The porpoises are also affected by the chemical pollution that collects in their coastal habitats and by marine traffic. Both the Black Sea and the Baltic Sea have pollution problems. The porpoises may be influenced by noise pollution as well as chemicals. Various regulations are in effect to help the endangered porpoises, including fishing regulations and environmental laws. A major problem is that multiple countries border or make use of the Black and Baltic Seas. A consensus is needed between different countries in order to obtain the best protection for the animals. Although the harbour porpoise population as a whole seems to be doing well, we mustn't become complacent about its status. Warning signs about the future are present in the Black and Baltic Sea populations and we need to pay attention to them. It would be very sad for the harbour porpoise to become endangered. Some conservation organizations are concerned about the porpoise and are recommending procedures to protect the animal from threats. It remains to be seen whether all of these recommendations come into effect. It's shocking and very troubling that humans have caused the extinction of an advanced animal like the baiji and that we may well cause the same result for the vaquita. I hope that the vaquita is saved and that the other species of porpoises remain safe for a long time to come. Thank you very much, sgbrown! I appreciate the votes. The state of the vaquita population is very sad. I hope there is a happy outcome to its story. Thank you very much for the visit, Dianna. It is very sad that the vaquita is endangered. As you say, it's a beautiful and intelligent animal. I hope it survives. 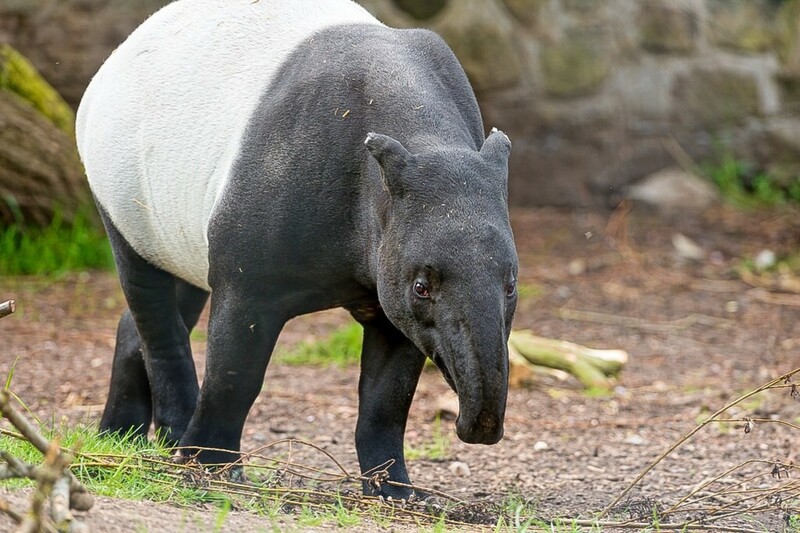 I hate to hear that these animals are endangered. They are so beautiful and have such great intelligence. Thanks for the update and for sharing. Hi, Peggy. Thank you very much for the votes and the tweet. I hope that conservation efforts help endangered species too, especially the ones that humans are pushing towards extinction. I had never heard about the vaquita or sad fate of the baiji. 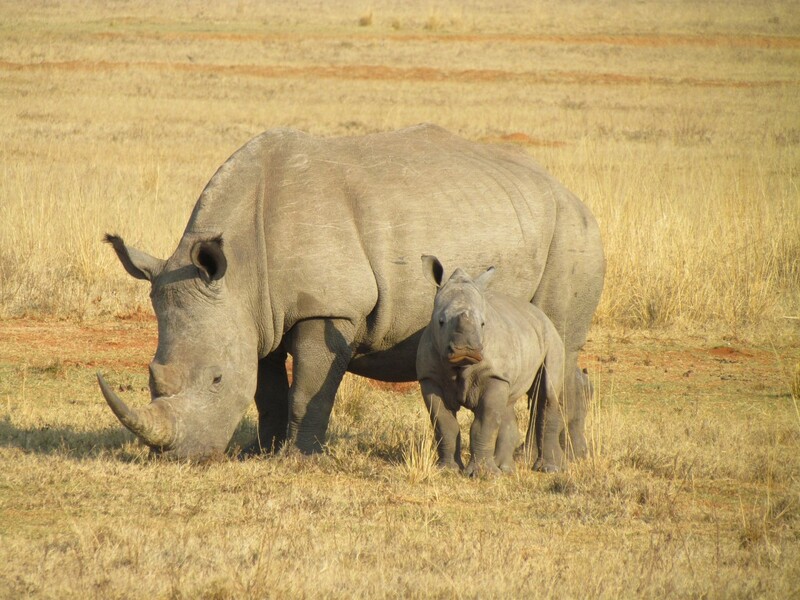 Hopefully conservation efforts will help all endangered species before more become extinct. Thanks for this informative hub. Enjoyed the videos. Up, useful and interesting votes. Tweeting. Thank you for the visit and the comment, CMHypno. It's very sad, but you're right - there are probably other marine species which have become extinct in our lifetime without our knowing that they ever existed. What is very worrying in this situation is that as recently as 2006 humans caused the baiji - a dolphin relative of the vaquita - to become extinct, so it is very possible that the same thing could happen to the vaquita. One good sign is that conservationists are aware of the danger after the sad story of the baiji and are trying hard to protect the vaquita. Another fascinating hub Alicia and thanks for introducing me to the vaquita. I hope that they can be successfully protected and somehow grow the population. We are losing too many species to extinction and it is a depressing thought that there might have been marine species out there that have gone extinct even before we discovered their existence. I would be very unhappy if the vaquita became extinct, too. Thanks for the comment, deb. The vaquita was new to me, and I would hate to see its demise. Hi, drbj. Thank you for the visit. It is very sad when a creature becomes extinct because of human activity. I hope the vaquita survives. I know about dolphins and porpoises in general, Alicia, but the vaquita is a new species to me. How sad it would be for it, or any other creature, to become extinct because of unthinking humans or male dolphins on a rampage. Thank you so much, Bill. It's frightening to realize how many animals are becoming endangered or extinct due to human action. The vaquita is in very serious trouble. Bravo for writing this! Awareness needs to be raised or we won't have any animals left in the wild. Well done! It is very sad that the dolphins kill the porpoises, but that's the way that nature works in this case! Thanks for commenting, Melissa. Such a shame that bottlenose dolphins cannot control their lower hormonal instinctual behavior and rage and can't bring themselves to stop killing their oceanic cousins.